"We knew the same gene stimulates the production of black pigment in other animals, but it's also responsible for camouflage in mice and red hair in humans," said Andrés, U of S biology professor. "There was no evidence of a correlation with coloration of frogs until now." 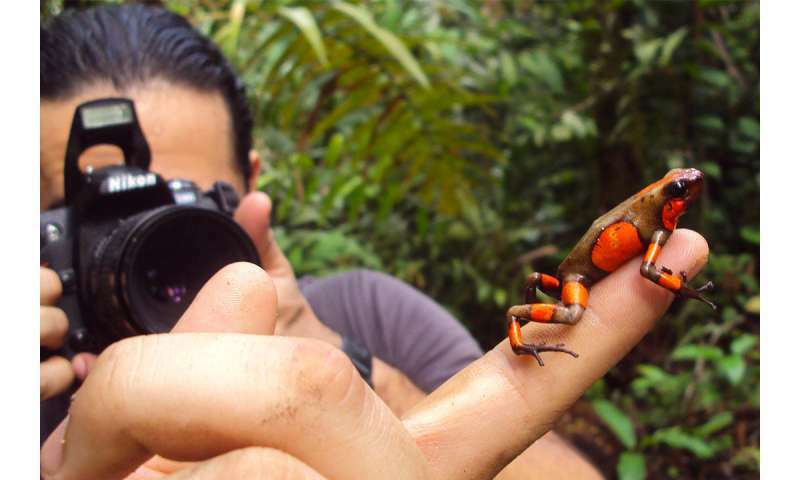 The black patterns provide a sharp contrast to the dart frogs' bright colours—red, yellow and orange—to send a highly detectable warning signal to predators such as snakes that the frogs are toxic, much like the coloring of wasps and bumblebees. "These warning patterns are very effective and they are easily learned by predators," said Posso-Terranova. The researchers' surprising discovery was that unrelated species of frogs in the north and the south of the province show mutations of the MC1R gene in the same DNA region, explaining why the frogs share similar black patterns even if they are not close relatives and live hundreds of kilometers apart. "These mutations associated with black colour show the footprints of natural selection," said Andrés. "It confirms that dark patterns are beneficial for frogs' survival, so it has been passed down through generations." Conducting research in a country with an unstable socio-political situation wasn't easy. "Only thanks to recent peace negotiations between guerrilla groups and the Colombian government is it possible for scientists to access areas once off-limits," said Posso-Terranova.